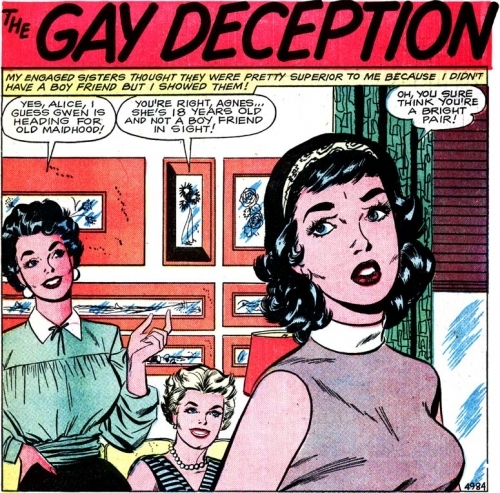 Art by Vince Colletta Studio from the story “The Gay Deception” in FIRST KISS #8, 1959. Click image to enlarge. SCENE: Two smiling women look towards an other woman who looks apprehensive. SMILING WOMAN #1: So it’s not just men and household appliances! I’m irresistible to women too! I really want to read the rest of the original story. And of course, while comicbookplus.com has several issues of First Kiss, they’re missing number 8. I won’t have time the next day or two, but I will post the entire story here sometime within the next few days. And, yes, Comicbookplus.com is great. I’m on the site all the time. Groovy! I’ll keep watch for it. I should add that I’m not affiliated with comicbookplus.com in any way. Thanks for the info….. The site looks quite interesting.